Learn because the printer jammed paper in the printing process, there are different methods and paper jam will tell you that really happens. When a printer crumples pages and a paper jam occurs, we have problems with the printing process. When we speak of the printing process we refer to the path of the pages before leaving. When a page is jammed in the printer it is best to follow the process to remove the paper jam, all printers in the manuals are specifically as eliminate any problems, the paper jam is one of the problems that occur more often in the printer. The elimination of a jam right way you can get it without much difficulty in the early parts of a manual. 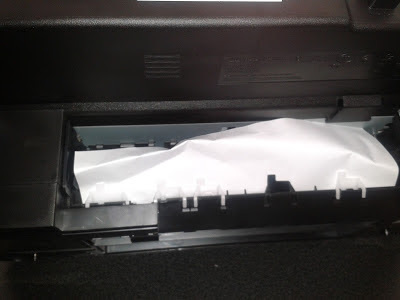 Paper jams where the paper is completely crumpled may occur for several reasons, one of the first is interrupted by an object inside the printer to prevent passing the page completely. Normal in a printer is a route for the page through the printer for almost all without stopping the cylinder printer toner cartridge and fuser do their work. Understand that the space through which pass the pages is a small space is critical, know that it is possible for any object, piece of paper or insects can stay at this place serves also may henceforth consider checking pages before putting them to the printer is something that helps to prevent such problems occur frequently. The toner cartridge to the printer we could say that 40% of jams when the paper ends completely wrinkled due to problems with the toner cartridge. If we fill the toner cartridge or sent to them to fill it, then it has a problem with the paper jam is where the problem lies, as always we should be eliminating possibilities, possible problems. In case you have not sent or refilled toner cartridge paper jam wrinkle us page may be due to the type of paper you use, just to remove the paper jam the printer manual has information about the type of paper we can use for the printer when using the paper type that does not match you can as we have said that the small space where it does not pass through the pages. Influences in the same way when the wrong paper loaded in the input tray papers, it is possible that the ends of the paper tray are not well positioned, the role even before entering the printer must be focused on their entirety, can not be paper without adjustment. When paper is much goes to the printer may jam paper crease the paper occurs, this causes misfeeds paper jam and wrinkle before leaving. Finally check the star wheels are just as the paper exits the printer, these wheels like all others, only that they are usually iron, say finally to the site and do not allow it contacts the body of the printer.